The Vampire Diaries Sneak Peek: Crazy or Crazy Secure? Caroline and Bonnie bond over guys in this clip from The Vampire Diaries. One of them has one, the other one really wants one. 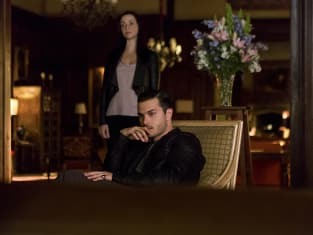 What will happen when Stefan spends a lot of time with Valerie on The Vampire Diaries Season 7 Episode 5? Watch this promo and find out! Everything is coming up Salvatore, so much so that I have decided to turn over a new leaf. Permalink: Everything is coming up Salvatore, so much so that I have decided to turn over a new leaf. Alaric: She's been sleeping for 12 hours. That's normal, right? Bonnie: Yesterday she was dead. Today she's alive. I'm not sure normal applies. Permalink: Yesterday she was dead. Today she's alive. I'm not sure normal applies. The Vampire Diaries Round Table: BONENZO FTW!